Reason; Killarney is in the middle of Kerry also known as the “Kingdom of Kerry” and you can easily visit Dingle Peninsula, the Ring of Kerry, the Gap of Dunloe, Skelligs, the Skellig Ring the Beara Peninsula without having to pack your bags and move on. 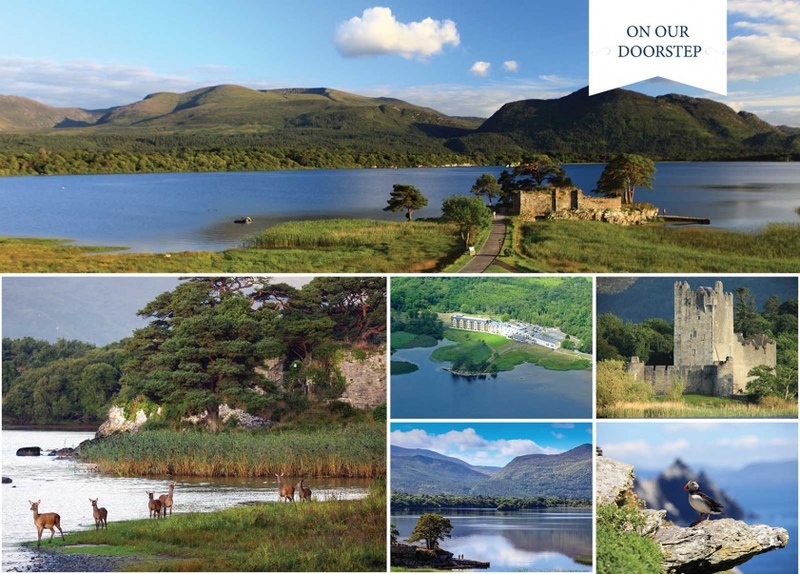 Visitors have been traveling to Killarney for over 200 years to see its legendary beauty and it is easy to see why they came then and why they continue to come now. Here at The Lake Hotel, we are unbelievably fortunate to be located in a place of such natural beauty and splendor. As you stroll out the lounge doors of the hotel the Lakes of Killarney and the Killarney National Park are on display in front of you. Visit our onsite 12th Century Castle which is floodlit by night. Watch the Wild Deer from the Lake Hotel, Eagles, Egrets, Herons and many duck and bird species. The town of Killarney is set on the Ring of Kerry which is a world famous touring route celebrated for its scenery. The day trip of the Gap of Dunloe can start and finish at the hotel's private pier and takes in a boat trip on the lakes in addition to the pony and trap journey through the Gap itself. Slea Head and Dingle are only an hour’s drive to the north-west of Killarney and the drive to Dingle is in itself a reason to take this trip. The charming town of Dingle and the rugged majestic landscape of Slea Head would take your breath away, a world apart from the lush, verdant beauty of Killarney and the lakes. These are just some of the day trip options available when based in Killarney and at The Lake Hotel. There are many more and we are happy to make recommendations or assist you with information before and during your stay with us. We are happy to provide local maps and recommend routes and refreshment stop to our guests. Packed and picnic lunches can be organized for small or large groups with advance notice. Information on day trip operators, timetables and costs are all available from Hotel Reception.